Large trees can provide a great deal of value to a home or a piece of property, but they comes with some risk. When you own a large tree, you should consider having it professionally assessed every year, or after any serious storm for tree health. Hazard Tree Assessment can seriously mitigate the risks of owning large trees. Harsh storms can do structural damage to a tree that can be easy to miss unless you know exactly what you are looking for. Similarly, there are a wide variety of systemic infections and diseases that can make trees more likely to fail. Our hazard tree assessment team looks at two main issues when assessing a tree. Is there a defect in the tree that could result in part of the tree failing? If the tree does pose a hazard, is there something nearby that could be damaged if it does fail? We look for structures, power lines, and the potential for a deadly accident involving a person. We understand how valuable a tree can be, which is why we advocate for continuing care and evaluation of trees. When proactive steps are taken to ensure the long-term health of a tree, you can often prevent issues that could result in tree failure from ever occurring. Mature trees ad a great deal of curb appeal and monetary value to a property, not to mention the sentimental value that it brings to you and your family. New Day Arborist & Tree Service can give you tips on how to best care for your trees, no matter what species or condition. Whose Responsibility Is A Hazard Tree? The responsibility for a tree always falls on the home or property owner to maintain a safe environment around their property. We understand the legality issues surrounding trees and many of the implications therein. Providing proper care and maintenance for your tree is the first step you should take to ensure you are doing your due diligence for the safety of your family and property. 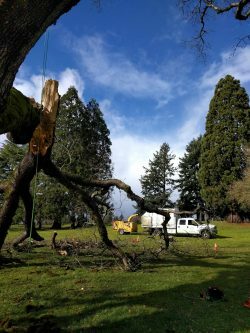 New Day Arborist & Tree Service in Vancouver, WA will give you an accurate and fair hazard tree assessment that will help to put your mind at ease. If we find that any part of the tree is hazardous, we will suggest a mitigation method that is the least intrusive and allows you to keep the safe portions of the tree. If we find that the tree itself is a risk, we offer hazard tree removal to ensure your family and property remain safe. Call us today at (360) 608-8160 for your hazard tree assessment.